That was the first time I ever heard of the Virgin Islands, and it was many years later that I went there — with no expectation of a transformative effect, by the way. The attraction for us was the clear, warm water and beautiful beaches that are characteristic of the Caribbean Sea. 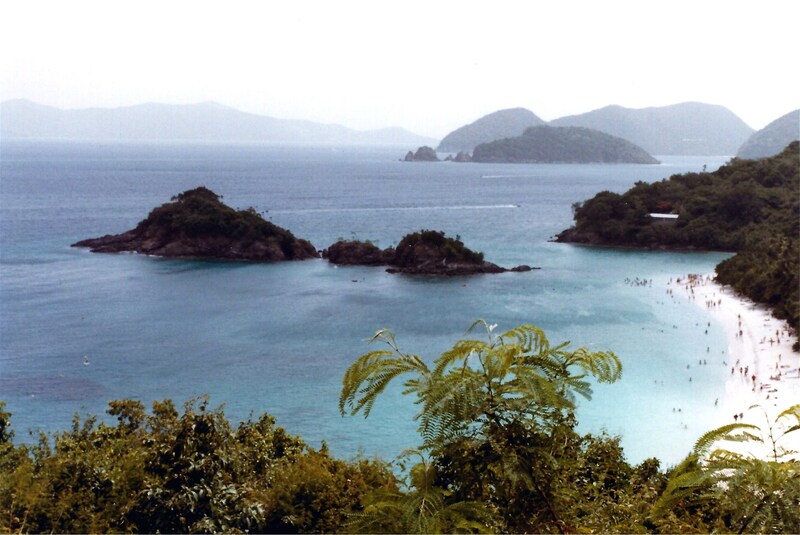 In fact, the Virgin Islands form part of the border between the Caribbean and the Atlantic Ocean. Christopher Columbus had discovered this particular chain of islands on his second voyage in 1493, naming them “The Islands of St. Ursula and the 11,000 Virgins”. That was based on a legend of early Christian martyrs, but the name proved to be cumbersome for mapmakers, and also exaggerated the number of islands. Just to the northeast of the U.S.V.I. are the British Virgin Islands, consisting primarily of Tortola, Virgin Gorda, Anegada and Jost Van Dyke. St. Thomas gets a lot of cruise ship traffic in its main town, Charlotte Amalie, but there are many tranquil spots elsewhere on the island, like Magens Bay. It is often cited as one of the most beautiful beaches in the world, and not just by the local tourism board. A long curved stretch of white sand facing the Atlantic, it is fringed with palm trees and looks very much like those postcards of tropical beaches that you’ve seen. The snorkeling isn’t sensational at Magen’s Bay, but it’s excellent at Buck Island (off St. Croix) and Trunk Bay (St. John). Both have a nice feature for beginners: underwater trail markers that identify fish and coral found there. There is also good snorkeling on Virgin Gorda at a spot called the Baths, where giant boulders on the beach form caves in which shy fish try to hide. Ferries run regularly between the U.S.V.I. and the B.V.I. It’s a fairly short trip, but on the day we crossed from St. Thomas to Virgin Gorda on the “Bomba Charger”, the waters were a little choppy. A few passengers started to feel queasy. One of the crew members produced a bottle of green liquid and asked if anyone wanted “seasick medicine”. For those who took him up on the offer, he poured a little of the potion on a paper towel and told them to sniff it. Before long, the afflicted passengers claimed to be feeling better. Hey, whatever works, huh? And for all I know, maybe someone in the Virgin Islands had something that “cured” my co-worker Shirley, too. This entry was posted in Travel and tagged Magens Bay, St. Croix, St. Thomas, the Baths, Trunk Bay, Virgin Gorda, Virgin Islands. Bookmark the permalink. lol at the rush hour remark! that’s so true- I’ve been to Chicago and NYC! very nice post, I definitely hope to go explore these islands someday. If I had to select my ten favorite beaches in the world… well, I think I could probably narrow it down to maybe a hundred or so. There are a lot of wonderful places to see, aren’t there? Part of the appeal of the Virgin Islands, I suppose, is that there is such a range of accommodations. For those who don’t enjoy camping, there are some very luxurious resorts — and everything in between. We didn’t get to Jost Van Dyke, so missed out on the Stress-Free Bar. It sounds great!